Here’s a quick Twitter SEO observation. For the longest time, I had my about.me profile URL in my Twitter bio. 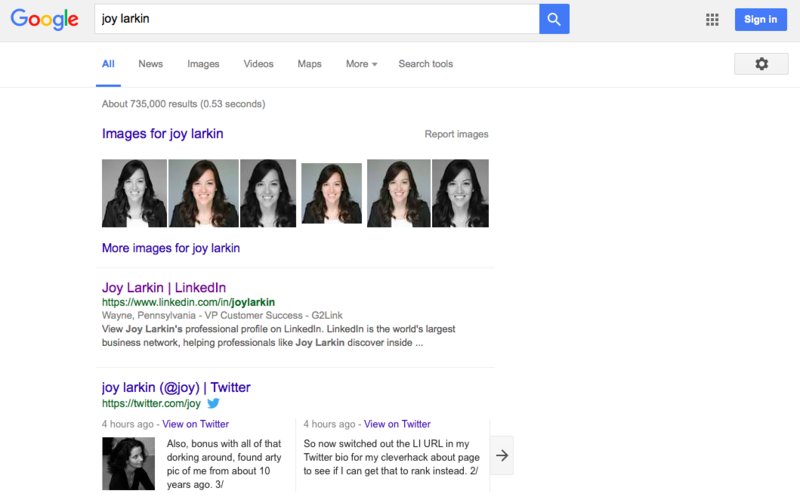 It was ok (the analytics for the free version are less than optimal), so I decided to see if switching up the URL would improve SEO for Joy Larkin, as there are a few women named Joy Larkin on the Web, and of course, I wanted to rank first. Last week, I added my LinkedIn URL to my Twitter profile. After a few days, my LinkedIn profile ranked first. Being ever curious, tonight I added my cleverhack about page to my Twitter bio. Now I’ll watch to see if that gets ranked first for my name. This entry was posted on Wednesday, February 3rd, 2016 at 11:42 pm	and is filed under Internet, Web Marketing, SEO. You can follow any responses to this entry through the RSS 2.0 feed. You can skip to the end and leave a response. Pinging is currently not allowed. I’ve had outsidethebeltway.com in my Twitter profile since the beginning and yet it ranks 5th behind my Wikipedia page, Atlantic Council page, my hardly-visited personal website, and my page at The Atlantic (for which I haven’t written for ages). That’s especially odd since OTB has a pagerank of 6 and jamesjoyner.com has no pagerank at all.